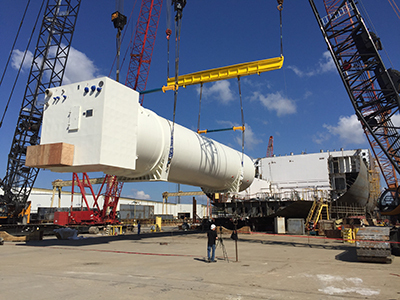 (PASCAGOULA; Oct. 21, 2015) ­– Construction of the first of two liquefied natural gas (LNG)-powered, combination container – Roll-On/Roll-Off (ConRo) ships for Crowley Maritime Corporation’s liner services group reached another important milestone last week, with the installation of three LNG fuel tanks. The double-walled, stainless steel tanks – which are 110 feet in length and 20.6 feet in diameter – weigh 225 metric tons and will hold more than enough LNG fuel for two round-trip voyages between the vessel’s future ports of call, Jacksonville, Fla., and San Juan, Puerto Rico. The Jones Act is a federal statute that provides for the promotion and maintenance of a strong American merchant marine. It requires that all goods transported by water between U.S. ports be carried on U.S.-flag ships constructed in the United States, owned by U.S. citizens, and crewed by U.S. citizens and U.S. permanent residents. Crowley’s two Jones Act ships, which will be named El Coquí (ko-kee) and Taíno (tahy-noh), are currently under construction at VT Halter Marine, Inc., a subsidiary of VT Systems, Inc. The ceremonial first steel plate cutting was celebrated with a ceremony held at VT Halter in October 2014. El Coquí and Taíno are scheduled for delivery second and fourth quarter 2017 respectively. The Commitment Class ships have been designed to maximize the carriage of 53-foot, 102-inch-wide containers, which offer the most cubic cargo capacity in the trade. The ships will be 219.5 meters long, 32.3 meters wide (beam), have a deep draft of 10 meters, and an approximate deadweight capacity of 26,500 metric tonnes. Cargo capacity will be approximately 2,400 TEUs (20-foot-equivalent-units), with additional space for nearly 400 vehicles in an enclosed Ro/Ro garage. The main propulsion and auxiliary engines will be fueled by environmentally friendly LNG. The ship design is provided by Wartsila Ship Design in conjunction with Crowley subsidiary Jensen Maritime, a leading Seattle-based naval architecture and marine engineering firm. “These new ships will offer customers fast ocean transit times, while accommodating the company’s diverse equipment selection and cargo handling flexibility – benefits customers have enjoyed for over 60 years,” said Hourihan. Designing, building and operating LNG-powered vessels is very much in line with Crowley’s overall EcoStewardship© positioning and growth strategy. The company formed an LNG services group last year to bring together the company’s extensive resources to provide LNG vessel design and construction management; transportation; product sales and distribution, and full-scale, project management solutions.